Cora Camille presents a supper show series every Friday in March at Jumpin Jupiter, 7376 Manchester Road, Maplewood, MO 63143, phone (314) 645-5867. Featured in the show will be live music by Final Veil and array of beautiful bellydancers. 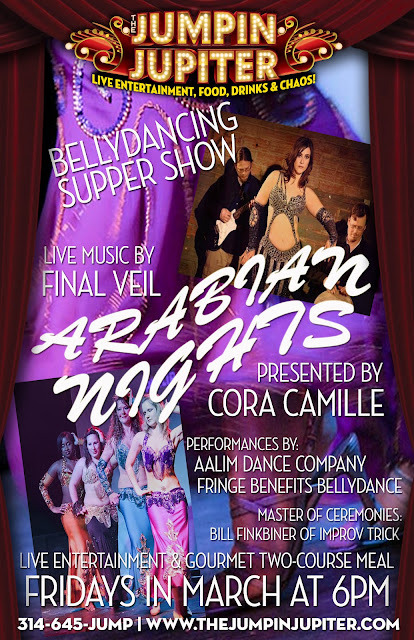 Every week’s show will feature new dancers including Aalim Dance Co., Arabian Silks, Salwa, PixieNyx, Kandi Grossman and The DragonFlies (Columbia), Chellcy Reitsma (Malta, Europe), Fringe Benefits Bellydance (Chicago), LaDiana (Puerto Rico), and Sumaiya! Bill Finkbiner of Improv Trick will be our Master of Ceremonies for the shows. It is recommended to buy a show ticket in advance due to limited seating and you can purchase the gourmet two-course meal separately. Dinner starts at 6pm and the show goes until 8:30pm. The Arabian Nights show will feature an intricate web of storylines from the east woven together with music and dance and featuring dancers with fire, swords, veils and more surprises! This is a show unlike any other that has come to St. Louis so show your love and come out to Jumpin Jupiter on Fridays in March! Click on the button in this post to purchase tickets!